Only one of the top four teams in the first College Football Playoff rankings ever was coached by John Heisman, and the former Auburn thespian would be proud—not only for his old (and no doubt favorite) team, but for the entire game of football. It was Heisman, after all, who, in addition to first implementing normal hurry up American football (while at Auburn), probably first proposed a four-team playoff to once and for all determine a consensus college football national champion. Professional baseball did it. Texas high schools did it. Why couldn’t America? Just split up the college football world into four regions: Northeast, Southeast, Midwest, Far West. Have “special committees” (sound familiar?) of sports scribes from each region decide that region’s champion (which is pretty much the way it already worked in the South). Pair them off. Have the victors duke it out in Chicago or New York or someplace. Winner gets all the marbles—all lower 48 marbles. Every last one. No more eastern snobbery. No more southern inferiority complex. No more endless debates. 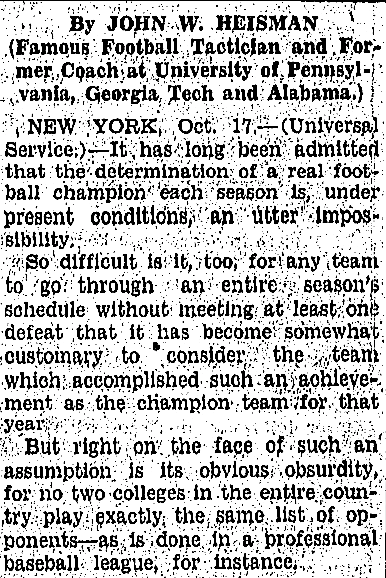 John Heisman advocated a four-team college football playoff in a 1928 column for UPI that published in papers across the country (and that ironically listed him as having formerly coached Alabama, LOL). “If we but had the plan working now what reams and reams of newspaper battling would be saved the public in the settling of the question of national supremacy,” Heisman wrote near the end of the 1929 season in response to the haters who a year earlier had called his plan impossible (because some schools might not want to participate? Weak…). He even came up with a mock playoff scenario for the 1929 season: Pitt vs. Tennessee, Cal vs. Notre Dame. Sure, everyone would probably have to give up their bowl games, or at least not have them really count for anything, Heisman thought, lest in hindsight their results challenge the validity of the championship. But all the handwringing about the Heisman plan extending the football season into the sacred month of December? Please—it was only four teams each year. Even if it was beginning to look a lot like Christmas, surely university presidents would sign off on an extra game or two if it was beginning to look a lot like a national championship. 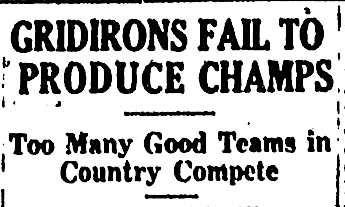 Lo and behold, a few weeks (and several reams of newspaper) after Heisman’s column, sports editors were still debating who should wear the 1929 crown: Pitt or Notre Dame, the two teams that likely would have locked horns in a Heisman-hatched final. Related: John Heisman: Auburn ‘the first to show what could be done’ with the hurry-up offense.